The relationship of the believer with the gods in Ancient Egypt was particularly loose. There was no set of doctrines or a central book or personal bond with any deity. 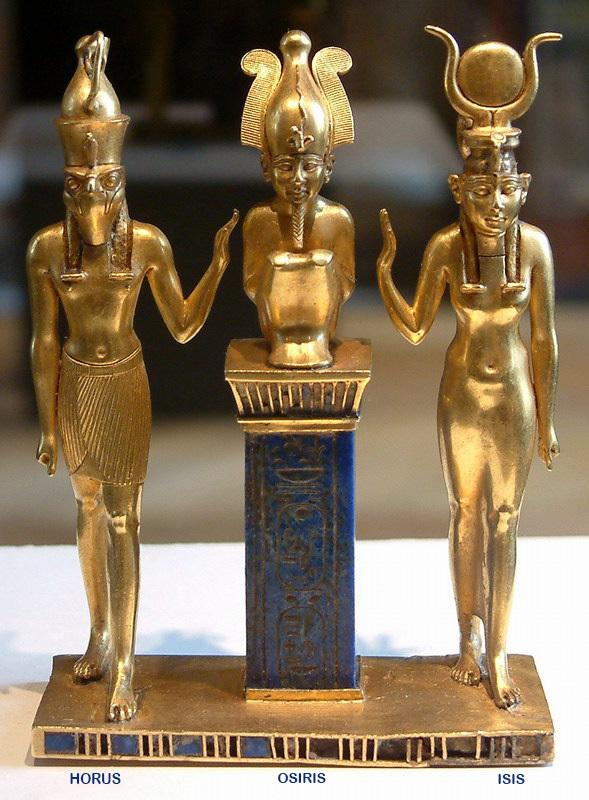 Only the holy being’s priests and Egyptian Pharaoh, who was also considered divine, could communicate with the gods. In addition, political changes could modify or transform the standing of a specific god or goddess. However, religion was of great consequence to the common Egyptian. It was deeply influenced by tradition, the concept of ma’at (order) and believe in an afterlife. Tradition and ma’at sort of went together. The Egyptians upheld tradition because change could bring chaos, the opposite of ma’at. If thing were going well, then Pharaoh and the priests were doing their jobs, if things were going bad, then changes were needed and the king and priests had to do something about it. Because of tradition, Egyptians hardly questioned their believes. The afterlife was all important. The body as the vessel of the ba or soul and therefore had to be preserved for all times. This credence led to great advances in the process of mummifying the body. When a person died, the ba had to face the God Anubis, who would weigh the heart of the deceased against the feather of justice and truth. If the heart war heavier, then the ba would be consumed by the demon Ammut. If the soul passed the test, then it would be lead by Horus to Osiris, the lord of the underworld, and to life everlasting. Temples were built to the different gods and goddesses in various places. The common people could not visit the temple, only the priests. It was up to the priest to serve the gods and keep them happy. Amun. The god of creation. He had no beginning. The patron of the poor, was called the King of the Gods. Eventually combined with Ra. The god sun, and was even more powerful. He had a temple built in his honor in the city of Thebes. He was represented as a ram, a man with a ram head or a man wearing a hat with an ostrich plume. Aten: A form of Ra/ Represented as a sun with rays than ended in hands. Bastet: A protective goddess. Daughter of Ra, the sun god. Associated with the cat, which was her symbol. She appears as a woman with the head of a cat. Hathor: Goddess of joy and love. Wife of Horus. She was represented as a woman with the ears of a cow, a woman with a headdress of a sun disk between horns and as a cow. Horus: The lord of the sky and Pharaoh himself. Lost an eye on his fight with Seth to rule the world of the living. The eye was restored, and it became a symbol of protection to the Egyptians. Represented as a man with a falcon head or a falcon. Isis: The wife of her brother Osiris and mother of Horus. Important because Pharaoh was considered Hours and therefore, she was the mother of the king. She was a goddess of protection who used her spell to help those in need. Isis is the patron of motherhood, magic and fertility. Isis represented as a woman with a headdress in the shape of a throne, usually carrying Horus in her arms, or by a pair of cow horns with a sun disk. Osiris: Ruler of the underworld and god of the dead, resurrection and fertility. When his brother, Seth, murdered him, Isis cast a spell and brought Osiris back to life long enough to be impregnated by him. He was depicted as a mummified man wearing the atef crown: a hedjet , the white, tall crown of Upper (Southern) Egypt, adorned with feathers. Ra: The sun god. It was believed that every night the sky goddess, Nut, swallowed Ra and he was reborn in the mornings. In some creation myths of the Egyptians, it was Ra and not Amun who created the world. Represented as a man with the head of a hawk. His head dress was a sun disk encircled by a serpent. Seth: The lord of chaos and a real threat to Egypt. Brother of Isis and Osiris, who he killed. He fought Horus, his nephew, for the right to govern humanity. Eventually he was exiled to the desert for eternity. He was depicted as a man with the head on an unidentified beaked animal.